A SWOT analysis is a strategic planning tool that helps to identify and compare strengths and weaknesses with opportunities and threats to make a decision and create an action plan. When performing a SWOT analysis, one can create a table split up into four columns so as to list each impacting element side-by-side for comparison, but typically it is conducted using a four-square SWOT analysis template. 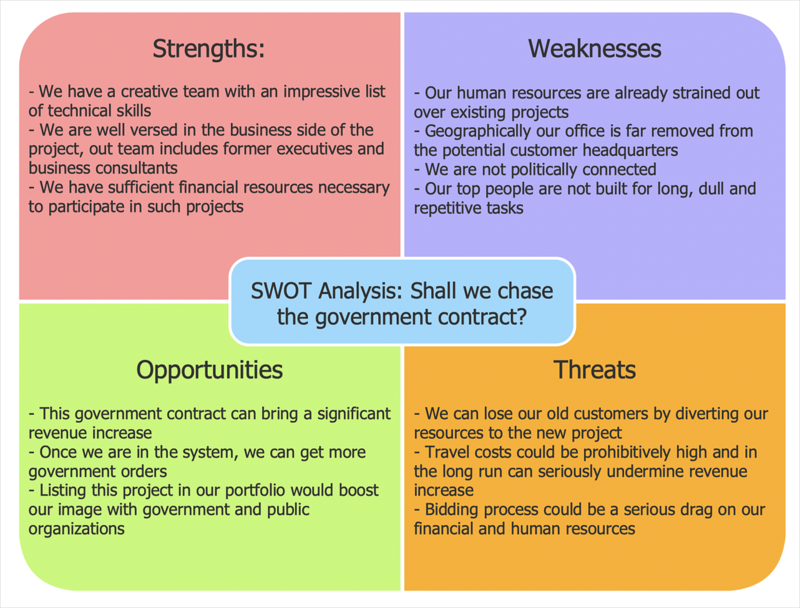 The SWOT Analysis solution contains the set of examples and template elements of the SWOT matrix. It helps you to make your custom professional-looking and clear SWOT analysis template using ConceptDraw DIAGRAM diagramming tools. Reveal the SWOT and TOWS solution in the Solutions panel. Add the SWOT elements to the diagram by dragging it from the library to the document page. Use Line, Fill, Shadow and Text tools provided in the Format panel to customize your SWOT matrix appiarence. You can save your SWOT matrix as template using the Save as Template option. Use your custom SWOT template to create one SWOT matrix that looks good, and also makes a professional impact. With your own corporate template, you can fully concentrate on your analytical purposes to gain insights into internal and external strengths, weaknesses, opportunities, and threats critical for your organization. Result: The SWOT matrix created in ConceptDraw DIAGRAM can be easily exported and included in documentation format used in your organization. Whether it is PowerPoint presentations(PPTX), MS Word documents or Adobe Acrobat PDF files. Define the goals of business engagement or project. Identify both the external and the internal factors that are either successful or not in order to achieve business objective. SWOT and TOWS analysis with mindmapping and diagramming tools.